We continue our series of some time ago. We have seen Yeshua as our Priest , as our Prophet , and now as our King. In John 14 Yeshua introduces to the disciples that He is going away. He is returning to the Father. This should not strike fear, but joy. Yeshua would send Someone who would bring Him ever present in every moment. The Ascension account in Acts 1 is very striking because He is lifted up as two angels are present to the disciples. They remind the disciples that as they see Him go up they would see Him descend to rule all nation’s in the same manner. Yeshua had indeed prepared the disciples as He had breathed on them the Holy Spirit. They had been filled but there was coming something extra. Ten days stood between Ascension and Pentecost. The command being not to depart Jerusalem until the Outpouring would take place. What happened in those 10 days? Yeshua was confirmed in His Kingship and the disciples were affirmed in their OBEDIENCE and preparation. We see Yeshua in Daniel 7 presented to the Ancient of Days where He was given Dominion and a Kingdom. We see clearly a change took place in time and eternity. In my understanding however finite it is, this was one of the rare events in time that had implications in eternal celestial affairs. Yeshua is given a dominion and a Kingdom , and according to Philippians 2 He is given a Name , and at that Name , every knee shall bow, and every tongue confess He is Lord. Therefore the connection between the Ascension and Pentecost that He is confirmed King and Lord. And as King and Lord He comes to institute the new Invisible Temple by sending His Holy Spirit. We can resume this to a Baptism but it is much more. It is a sign for all generations of the “Mark” of when Church is Church. The mark is the manifestion of King and Lord in our midst by bringing a new Pentecost. He can only do that as we reflect in our hearts that recognition and that submission to His Kingship and Lordship and call for the Pentecost in our midst. He will confirm His Kingship through His Church. Psalm 110 tells us the reason for Him being 2000 years at the Right Hand, until all enemies are under His feet. He has chosen His Church to do that work. It is a priestly work of intercession for every generation, a prophetic work of declaration over every saint His Word, it is a Kingly work of bringing to manifestation the work of bringing to the Church His Kingly authority to bring the enemy under His feet! 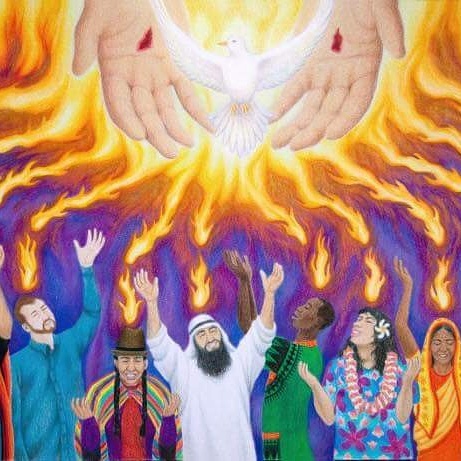 There were Catholic young people in a retreat in the 1960s who were praying around the time of Pentecost, and they asked God for a new Pentecost for which the Catholic Charismatic movement was born. This movement is still going strong and right now in the UK there is being poured out a prophetic anointing upon the movement. Let us see and recognise Yeshua in His Kingly position so that in us and through us a new Pentecost will pour out over us. Pentecost marks firstfruits. Marks the signs of the greatest harvest. Pentecost is 50 days after Passover and marks a jubilee number. Means freedom and rest in authority. May we see this manifest as we recognise Yeshua as King and call for His Kingship to be made manifest. Avoiding the Vacuum; Manchester attack.